The Le Mans winner Porsche goes to the Nürburgring with a new aerodynamic package for its 919 Hybrid. On the track in the Eifel mountains, the FIA World Endurance Championship (WEC) holds its fourth of nine rounds from July 22 to 24. As it heads into the six-hour race the Porsche Team is leading the manufacturers’ championship ahead of Audi and Toyota. The Le Mans winning drivers, Romain Dumas (FR), Neel Jani (CH) and Marc Lieb (DE), are leading the drivers’ world championship. 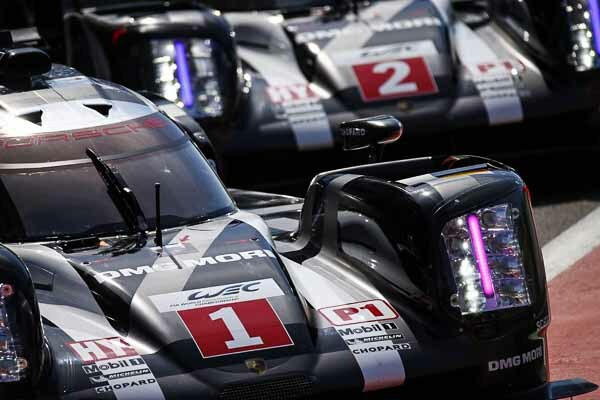 The crew of the sister Porsche 919 Hybrid, Timo Bernhard (DE), Brendon Hartley (NZ) and Mark Webber (AU), has three unlucky races behind it and is more than keen to repeat last year’s race win at the Nürburgring. A field of 33 race cars will compete in the Eifel. Prototypes and sports cars are divided into four classes, with the 919 Hybrid belonging to the top class for Le Mans Prototypes (LMP1). The 919 was developed in Weissach and produces a system power of over 900 HP (662 kW). Its combustion engine is a futuristic downsizing motor: the very compact two-litre V4 turbocharged petrol engine drives the rear axle with almost 500 PS (368 kW). Two different energy recovery systems – brake energy from the front and exhaust energy – feed a lithium ion battery that, on command, passes on the energy to an E machine to power the front axle with an extra boost of over 400 PS (294 kW). In the WEC three aero configurations per season may be homologated. Porsche started the season with the first spec, the second one was for low drag on the long straights of Le Mans. For now, with narrower circuits coming up, again a higher downforce level is required.